From your brake pedal to your kickstand, every single component of your bike needs to be taken care of and maintained. Whether it is a complete replacement or a straightforward adjustment, it’s crucial to the health of your bike that all parts of your bike are looked after – and your clutch is no exception. Is there a problem with my clutch? If you notice or feel any sign of wear on your clutch, it’s important that you check it out as leaving it neglected can cause the whole bike’s condition to deteriorate. 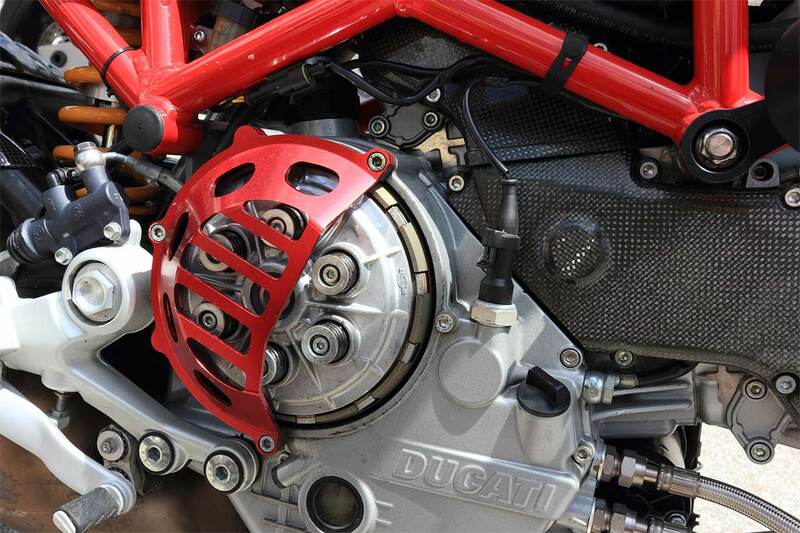 If you experience a stiffening clutch lever, find it difficult to change gears or hear a chattering sound while riding, there is likely to be a problem with your clutch. If you see that the rpm is increasing but your speed isn’t increasing at a normal rate, this is another indication that your clutch isn’t working efficiently. It’s common for the condition of your clutch to gradually wear and worsen, but it is also possible that incorrect levels of oil can affect your clutch. The clutch runs in oil to keep cool, but too much oil will drown the clutch’s driver friction plates causing them to slip. Incorrect cable adjustment is another error that can cause difficulty with your clutch. A loose cable will prevent the clutch from fully disengaging and an overly tight cable causes reduced tension on the springs, resulting in clutch slip. When should I change my motorcycle clutch? Ideally you will be regularly checking your clutch so that if any problems develop, you can quickly locate and resolve them. We advise having a read through your bike’s manual where your manufacturer should have recommended when you should change your clutch. Unless you are a confident and experienced mechanic, it’s best that you take your clutch to a qualified garage where you can rest assured that your bike and clutch is in good condition. Using quality oil and the one that is suggested by your bike’s manufacturer will help to extend the life of your motorcycle’s clutch, and delay its wear and tear. It’s easy to misuse your bike’s clutch, but using it in the correct way can help to keep it in optimum condition. Avoid changing gear until you have fully pulled the clutch in, and ensure you don’t release it until it is properly in gear. See more: When should you replace your chain and sprockets?